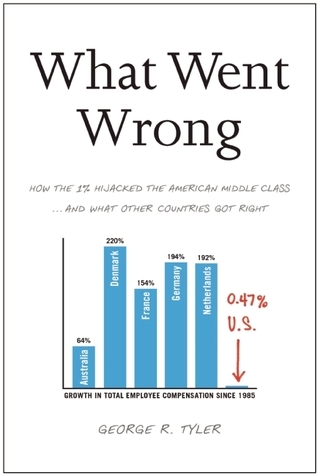 서명/저자 What went wrong : how the 1% hijacked the American middle class...and what other countries got right / by George R. Tyler. 발행사항 Dallas, Texas : BenBella Books Inc , 2013. Americans have long been proud of the strength and robustness of their economy. We’ve been told from the time we were children that we live in the best country in the world, with the most expanding and dynamic economy. We’ve been told that we live in the home of the American Dream, a country that—more than any other—allows people to rise up from poverty into the ranks of the rich. But the truth is average real incomes in the United States have been flat for more than three decades. Economic inequality in the United States is now closer to a third-world country than to our first-world peers, and is growing. Many things have been blamed for these failures—globalization, outsourcing, economic cycles, weakening education, and so on—but the reality is that the failure of our economy stems directly from a set of political and economic choices voters have made since the early 1980s. Proof of this is embodied in several countries—Australia, Austria, Belgium, Denmark, France, Germany, the Netherlands, and Sweden—that practice "family capitalism,” a variation of free-market capitalism that emphasizes corporate productivity and growth in family incomes. These countries, facing even harsher challenges than the United States, have achieved dramatically better results: growing wages, higher productivity, higher incomes, and lower inequality. This isn’t about the size of government or social welfare programs. And it isn’t about left versus right—prudent Australia, for example, had a right-wing government for many years and is ranked by the Heritage Foundation as far more free than the United States. It’s about policies on wages and corporate governance that have converted globalization to nationwide family prosperity and have been proven over decades to generate superior results. It’s about crafting an economy that creates wealth for all, not just for a few. It’s about returning to a set of policies that once made the United States the most dynamic and fair economy on the planet.